These rare items are handpicked from the ship or from the scrap yard. These items get refurbished and polished to give a vibrant look for home and outdoor decor purpose. With the talent of our competent team, we are presenting a broad array of TG – 2491303 to our valuable clients. Our product range is fabricated from high grade raw material by our team of skilled craftsmen and expert. These products are valued for their reliable performance, high quality standards and longer service lives. we are the very proud manufaturers and exporters of best quality of Brass Telegraphs.The range of telefraph we have is very big, we manufactures different sizes and kinds of telegraphs.The range starts from 4" and goes beyond 6 feet, and also available in different kinds of metals like brass & aluminium. A Telegraph is an apparatus for communicating rapidly between distant points, especially by means of established visible or audible signals representing words or ideas, or by means of words and signs, transmitted by electrical means. Telegraph key, mounted on a solid plastic base, measuring 11cm x 5cm, with two screw-type connecting terminals. 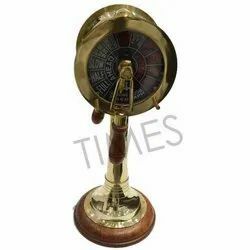 Nautical Brass Antique Ship's Engine Order Telegraph 6"
The ARI Full Mission Engine Room Simulator (FMERS) is a cutting edge, turnkey solution suitable for training Marine Engineers at Watch keeping, Operational and Management levels. We are a top-notch organization, engaged in providing Telegraph Equipment. We are trading company dealing in all types of used reusable marine electronics / navigation equipment & spares procured from ship-breaking yards, with an aim to supply reliable spares at right time -place at reasonable cost to the traders, service workshops and ship-owners.